Wake up with an early bath and add a handful of our Coriander Lime bath salts. The stimulating herbal & citrusy aroma of this salt will leave you feeling rejuvenated and ready to embrace the day ahead. 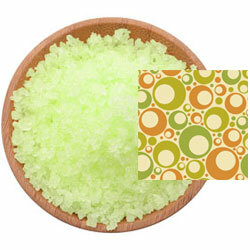 A fine/medium grain blend of Pacific Sea Salt with a refreshing citrus scent and a lime color. Scent: Coriander Lime Fragrance - The scents of Coriander (cilantro) and Lime joined together to create an uplifting citrus scent.